Editorial ­ Why a walk-through train makes more sense. A lot of new Monorail Society members tell us how they love the Anaheim and Florida Disney monorails. For many it was their first introduction to monorails. The trains definitely have "cool factor" with their sleek design. I understand this, I have had the same fascination and love for them since the first Disneyland-Alweg Monorail premiered in 1959. They have served well in both Anaheim and in Florida, carrying millions of passengers. Bombardier now markets their M-VI version of these trains. I was personally very disappointed when Honolulu and Houston did not build M-VI monorail systems proposed for their cities over a decade ago. I cheer the fact that we are now finally seeing them get a chance to operate in an urban setting in Las Vegas (albeit a very unique urban setting). Transit monorails have finally arrived in North America, thanks to this new system. Despite my appreciation of the M-VI system, in the last couple of years I have come to the conclusion that there is a better type of monorail for urban settings. In fact, the better train design is part of the original Alweg Monorail system of which Disney's scaled-down trains are based on. I have personally visited and studied monorails all around the world. Recently I made my second visit to Japan and studied seven full-scale monorail systems. I have seen what works firsthand. As a result, I now favor trains that have walk-through capability in transit-scale urban monorail systems. 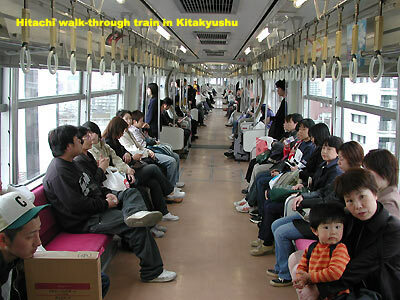 Walk-through trains allow passengers to board one end of the train, and if necessary or desired, walk from car to car or from end to end of the train. This isn't possible with compartmentalized monorails like the M-VI or the peoplemover monorails at Newark International Airport or Jacksonville. 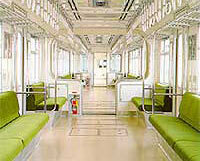 Passengers need the ability to move in and out of the train quickly and easily. They should be able to move freely within the train to facilitate quick loading and unloading. The ability of passengers to move freely from one car to another also gives the system operator the flexibility to open a limited number of doors for passengers boarding, while using other doors to unload passengers. This method can be witnessed at the confined Westlake Station of the Seattle Center Monorail. Click here for a comparative Train Loading Animation. Animation by Kory Pedersen. Flash Player required. When all seats are full in one car, passengers need to be able to seek out seats in another car. This is particularly important for the elderly and physically-impaired. At peak commuter times, cars may fill up making some areas of the train more uncomfortable or crowded than others. Passenger loads must be able to distribute evenly throughout the train. With a walk-through car, passengers even out the load of a train while they board and while in transit. With a compartment train, you're stuck with the car you walk into. 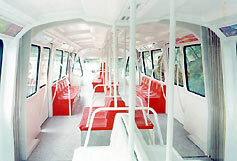 Passengers do not feel confined in a walk-through monorail. They are free to move about the entire train. If anyone needs assistance they are not confined to one car. The chance of being confined with an "undesireable character" is reduced with a train that is open from car to car. What could be more important than safety? In the unlikely event of an emergency hazardous situation, passengers should be able to move to another car to escape danger. If one car becomes overloaded passengers need to be able to move to other cars. There is the added benefit that if there is a fireman, medical person or someone capable of helping in an emergency--that person would be available to any location on the train. 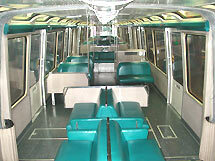 In compartmentalized trains, they are confined in their compartment. Additionally, in a compartmentalized train, all passengers might not be aware of a hazardous situation taking place in another car. Keep in mind that in the long history of Alweg-type monorails in Japan, we know of no situations in which an emergency evacuation was necessary since the first one started operating in 1962. However, transit standards dictate that all systems should be ready for any situation that might arise. Click here for a comparative Train Evacuation Animation. I urge that all transit authorities planning monorail carefully consider the above points. Why choose anything less than what was designed into original Alweg monorails over fifty years ago? I suggest that all future urban transit systems follow the example of the Alweg, the Japanese and Malaysians by choosing walk-through monorails. It's a standard for transit trains that should be universal. My sincere thanks to Greg Keleshian, Kory Pedersen and the TMS members that contributed their ideas for this editorial. 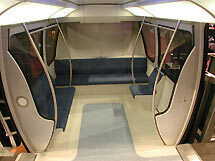 UPDATE: In 2010, Bombardier introduced the Innovia Monorail 300. This new train design incorporates important improvements over their previous M-VI monorail design, including walk-through capability. The prior M-VI design is now referred to as the Innovia Monorail 200. More information can be found in The Monorail Society Technical Pages on ALWEG systems.